I love this blush pink...the above image especially reminds me of the dress Angelina wore at the Golden's, but this looks much more demure and rich. The texture on this dress is to die for. I love how colorful and whimsical this dress is...very fun! This lilac color is subtle, but the lace and cutouts makes it a real crowd pleaser. This crystal gray color is gorgeous...it has a similar look/feel to a dress Cameron Diaz wore awhile back. This color is definitely different, but I can't help but love the cut of this dress and how it's sheer in places. I. DIE. over this dress...the color is stunning! Sometimes a short number can be pulled off...this has a "Mad Men" feel to it! There were SO many black dresses to choose from in this collection, but this one has it all for me...texture, lace, ruffle, a little sparkle...and of course, I love that it is slightly sheer. Just lovely! To see the entire Elie Saab collection, go here. I love the look of these Giuseppe Zanotti strappy sandals...they're elegant and not too distracting for the dress. 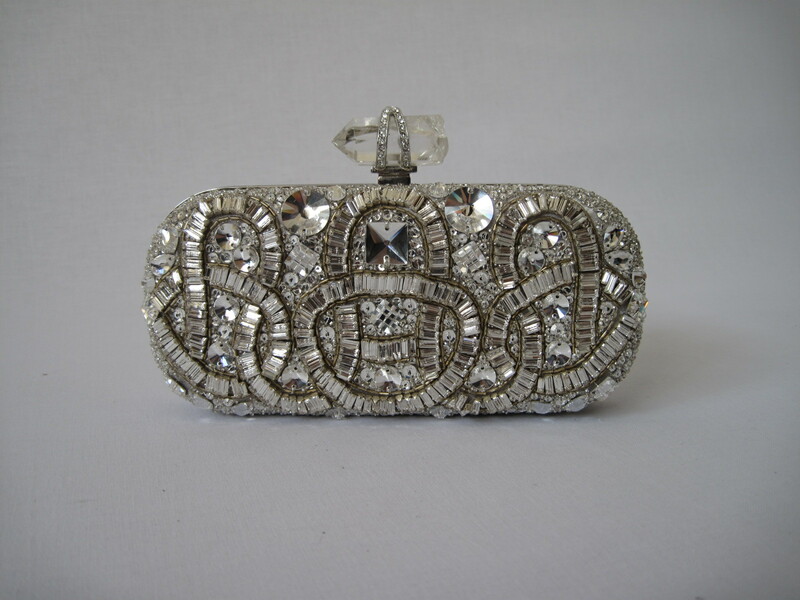 I love the look of this Marchesa crystal encrusted clutch. 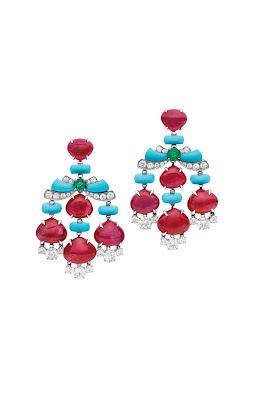 These Bulgari beauties have a little bit of everything...diamonds, rubies, turquoise, and emeralds! They would be show stoppers on their own. We're having a little Oscar Party on Sunday...can't wait to see what everyone wears! Wow, every single dress is gorgeous! OMG! Those dresses are to die for! So soft and romantic! I would take any one of them if I could! The red/deep raspberry color is stunning. Every dress is gorgeous! I think it would be fun to go on a very fancy cruise and wear each of those a different evening. I can dream! Enjoy your Oscar party. That sounds like a lot of fun! Hope your weekend is off to a great start my dear! xo! What great picks! I love that purple dress and those last pair of earrings are to die for!!! Those dresses are amazing. Omgosh I bet they were even more beautiful in person. Wow wow wow. Love your picks!!! Beautiful! And an Oscar party?! What a fun idea!!! You HAVE to post pictures!!! So very gorgeous!!! I desperately wish there was somewhere I needed to go in one of those beauties! Until then, I will continue to drool over these and the other fab pics that glided down the red carpet! (c: Hope the party was fabulous! My favorite gown was Mila's!! I featured it on my blog today as well. 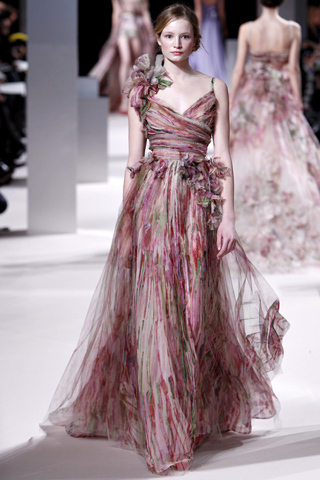 Elie Saab never dissapoints! You have such a great eye! Love love love Elie Saab. I'd kill for the gray sweetheart dress. Stunning!! Every dress is gorgeous! I think it would be fun to go on a very fancy cruise and wear each of those a different evening. I can dream! Enjoy your Oscar party. That sounds like a lot of fun! Find here essay writers to solve your class work problems.